There are two numbers in the blood pressure measurement: systolic pressure or the upper number and the diastolic pressure or the lower number. Systolic pressure is the measurement of the pressure in the arteries when the heart beats or when there is contraction of heart muscle. Diastolic pressure is the measurement of the pressure in the arteries in between two heart beat or when the heart muscle is relaxing and the blood is refilling in the heart. You should have knowledge of both your systolic and diastolic blood pressure readings as they are important measure of the health of your heart. 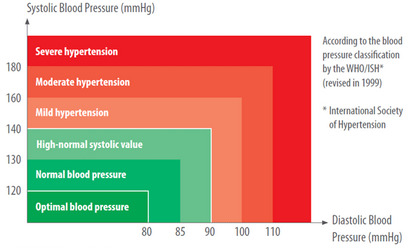 The unit of blood pressure measurement is millimeters of mercury or mmHg. During the beating of your heart, the heart muscle contracts and pushes blood into the arteries from where it reaches the rest of the body. This pushing force of blood exerts a pressure on the arteries which is referred to as the systolic blood pressure. The normal reading of systolic blood pressure is less than 120. A reading of 120 to 139 indicates prehypertension or borderline high blood pressure. A reading of 140 or greater indicates hypertension or high blood pressure. When the heart muscle relaxes or rests in between the heart beats, the pressure exerted by the blood on the arteries is known as the diastolic blood pressure. The normal reading of diastolic blood pressure is less than 80. A reading of 90 or greater is indicative of hypertension. A mathematical formula, blood pressure is indicative of the pressure that is exerted on the blood vessels while the heart is beating over the pressure that is exerted on the blood vessels in between heart beats-optimal blood pressure being 120/80. The term “isolated diastolic hypotension” is coined by researchers for a condition during which the diastolic blood pressure is lower than 60 mm Hg while the systolic blood pressure remains greater than 100 mm Hg. According to researchers the condition is similar to a condition referred to as isolated systolic hypertension, where the systolic blood pressure is greater than 140 mm Hg, while the diastolic remains normal. This condition is common in the elderly and it increases the risk of heart failure. According to Dr Ali Ahmed, senior investigator of the study and professor of medicine in the Division of Gerontology, Geriatrics and Palliative Care, the study findings demonstrated that the elderly individuals who have low diastolic pressure but high systolic pressure were at a greater risk of new-onset heart failure in comparison to those who have high diastolic blood pressure. Moreover, the risk of death is higher in the elderly with low diastolic blood pressure. It was also found by researchers that isolated diastolic hypotension can develop in those individuals who take medicines to control their high systolic blood pressure. In such cases the trick for physicians treating the patients is to prescribe medicines in such a manner so as to lower the high systolic blood pressure without lowering the diastolic blood pressure too much. Unfortunately in cases where the diastolic blood pressure become low without taking any antihypertensive medicine, little can be done. It also remains unclear that whether addressing the risk factors of heart failure would decrease the risk of developing a heart failure or not.